Banana (Musa spienta) belongs to the Musaceae family. Native to Southeast Asia, banana is available all year round. The banana tree is a herbaceous plant and not a tree, but it can still reach heights of 30 to 40 feet (9 to 12 m) tall. 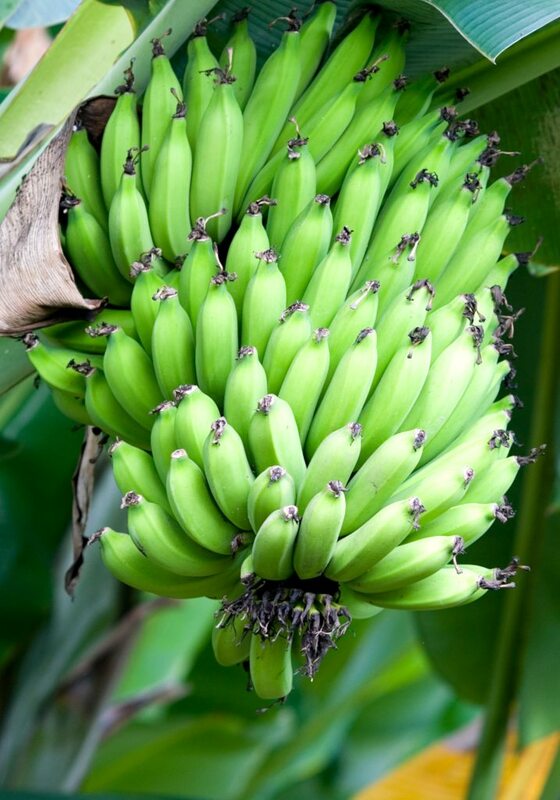 Banana trees grow in regions with a lot of sun, especially Guadeloupe, Martinique and the Canary Islands. The ‘Cavendish’ cultivar is the variety that athletes eat most. Plantain cooking bananas (Musa paradisiaca), being more exotic and less sweet, contains more starch. It’s considered as a vegetable in Africa and is eaten cooked. Banana gives us many therapeutic and preventive benefits. Banana has been a part of our diets for millennia. In caveman days, its leaves and trunks were worn for clothes, to make tools and for temporary shelter. 500 years BC, banana started being considered by Hindu tradition as a sacred fruit. Some say a banana is what Eve gave Adam, explaining why it is sometimes called the “paradise fruit”. Alexander the Great forbade his army to feast on bananas: he thought it would make his army “heavy and unfit to fight”. Banana has spread to many places, to India, Africa, and the Canary Islands. The XIXth century is when bananas starting arriving to Europe and appeared in market stalls, hailing from the French Antelliean Islands. Banana is an excellent anti-diarrhea. It facilitates digestion and regulates intestinal transit. For digestive ailments, banana soothes inflammation and burns occurring in the digestive tract. Banana counters stomach acid and also protects the mucus linings that encapsulate stomach cells, thus putting off appearance of gastric ulcers. Banana is an incredible energy reserve. It provides 90 kcal / 3.5 oz (100 g) and 0.7 oz (20g) carbohydrates. Athletes love it for the fact that it staves off cramps. Banana has antioxidant properties. It thus watches over cellular regeneration and reduces the risk of cardiovascular diseases by reducing bad cholesterol. When it is very ripe, banana can be an effective contributor to cancer prevention by stimulating and activating immune cells. Daily consumption of bananas can reduce expansion of kidney cancer. Banana is recommended to persons suffering from anemia. With high levels of iron, it promotes red blood cells (erythrocytes) production, the cells that carry oxygen around in the blood. “I’m going bananas”: this saying isn’t without cause! Indeed, bananas contain an amino acid called tryptophan which is a building block of serotonin, a hormone that regulates joy and excitement. Banana fixes your mood! High potassium contents of banana (411mg/100g) decrease arterial hypertension and thus reduce risk of stroke. Potassium also plays a part in heart muscle contraction. For children, it reinforces bone cells and helps them expand. 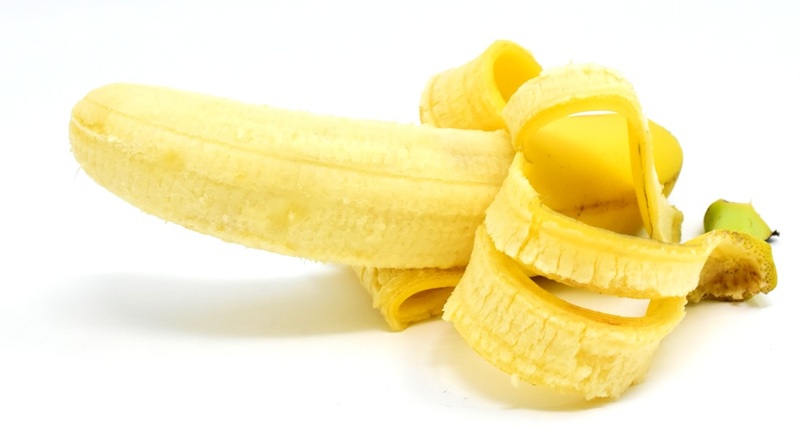 Banana skin is an aid in wound-healing, in case of wounds or animal bites. Banana seems to be an effective way to stop smoking. 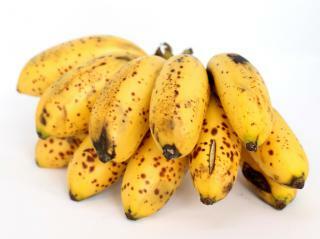 The vitamin B included in the banana’s flesh soothes stress and anxiety which appear when stopping cigarettes. Banana can be eaten raw, in fruit salads, smoothies or even flambee. 90 kcal / 3.5 oz (100 g) of banana provides starch, vitamins C and B, potassium, magnesium and iron. Since the glycemic index of banana is 65, diabetic persons shouldn’t be eating too much of it. Wrapped in foil on the barbecue – Slice your banana lengthwise, slide a few squares of chocolate, and wrap it in aluminum foil. Place directly on the embers in your barbecue! Green banana chips – Slice your plantain banana thinly. Dunk the slices in very hot oil. Douse with salt and serve them either hot or cold for appetizers. Mashed fruits – Use damaged or overripe bananas: fry them in a pan with other damaged fruits (peaches and apricots will pair well with bananas), a table spoon of water, some cinnamon and sweeten to taste. Don’t really cook it, simply let some water evaporate. Eat either cold or hot, on hot toast or with cottage cheese. Against warts – place a square of banana skin on the wart. Stay it in place with a band-aid or plaster. Your feet will thank you for it! Banana scrub – mash one banana, add 2 table spoons sugar. Spread the pulp on your face and rinse off. The banana will hydrate your skin and the sugar will rub dead skin off. For white teeth – rub the inside of a banana peel on your teeth. Ink stains – rub your hands with the inside of a banana peel, this will remove ink stains from your hands. Relaxing properties – on burns or insect bites or itchiness, again, rub the inside of a banana peel. Banana skin is the perfect fertilizer. It leaches nutrients and minerals that are crucial to flower-bearing plants. Bury banana peels at the foot of the plant. The inner portion of the banana peel can be used to wipe dust off your indoor leaf plants. Did you know? According to a legend in the Antilles, getting married under a banana tree is a bad omen. It predicts that the woman will be a bad mother and that the husband won’t be happy. The banana tree can be planted as easily in a pot indoors or in the ground outdoors. However, it fears winter cold. Bringing the pot indoors from October to May is recommended. If it’s planted directly in the ground, protect it well. In an indoor pot, place the banana tree in a well-lit room, but without any direct line to the sun. Misting water very often on the leaves is enough to water it. Outdoors, plant your banana tree in the sun, in spring or early summer. Water it every 2 to 3 days in case of heat waves. In winter, moisten the soil around it only when the surface of the soil is dry. In either case, lay down a layer of gravel before planting.